It's easy to keep your store organized and attractive. Using the fully assembled Full Vision Display Cases from Store Supply Warehouse, retailers can create attractive displays highlighting their most precious merchandise, antiques or collectibles. 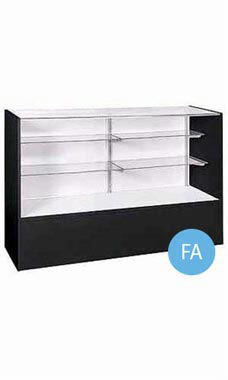 Featuring a tempered glass front and top, with two rows of adjustable 1/4" split glass shelves. These showcases will provide retailers with ample space for display and customers with a full visual of the inventory being purchased. The black low pressure melamine laminate exterior matches all of our black display units, while complementing the white deck and doors and aluminum hardware. An optional lock and light kit are available to top off your display case. Overall, this showcase measures 38"H x 18"D x 48"L. This classic unit will give you years of affordable elegance and dependability for your retail store. Crating for secure shipping is included in the price of the case. Fully assembled and available for immediate shipment. This display is great for retail shops. It is made very well, very sturdy. I bought the ore assembled and it was worth it. The display arrived quickly, in perfect condition , ready for my retail showroom.